From Apprentice to Permanent – Employee Engagement and motivated Staff from the very Beginning! Lena Schmid, Rebecca Roser and Aline Guggisberg have completed their apprenticeship in business administration at Congrex Switzerland. Since then they work as permanent employees at Congrex and help to enhance customer satisfaction. Congrex Switzerland started to train its first apprentice, Lena, in 2011. Today she works as Congress Coordinator. Rebecca, who now works as Accommodation Coordinator, completed her apprenticeship from 2012 to 2014. Aline started 2013 and now supports the Industry Relations team. All three ran through numerous departments during their training, such as front desk, industry relations, meeting planning, travel, registration and accounting. The decision to remain in the company was straightforward to take. Mainly because of the fabulous team and the friendly working environment. A further reason was that they had already felt like an essential part of the team. They had learned a lot, which they are now able to apply in their everyday working life. A particularly delightful part of their job are the many conferences and events where they can help on-site. Lena especially remembers her first conference: the International Liver Congress 2014 in London. Rebecca’s highlight was the International Aids Conference 2016 in Durban, where she met celebrities like Prince Harry or Elton John. Furthermore, she had the opportunity to complete her stay with a private safari. The OSCE ministerial council meeting 2014 in Basel was the event Aline likes to remember. 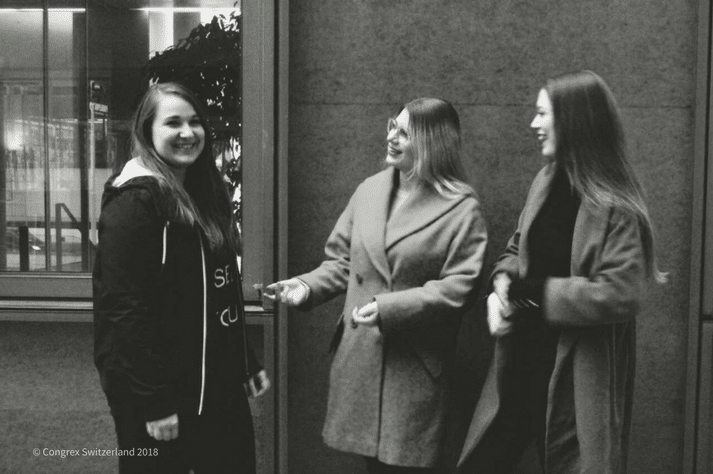 Because of Congrex Switzerland’s flexible working model Lena and Rebecca now have the opportunity to obtain a bachelor’s degree. Since 2015, they study at the FHNW University of Applied Sciences and Arts in Basel and have a 70% part-time job at Congrex. More and more employers today are aware of the benefits of apprenticeships. They can teach young people the skilled workforce they need in the company, and a successful training creates motivated employees. Employee engagement can drive business success enormously.